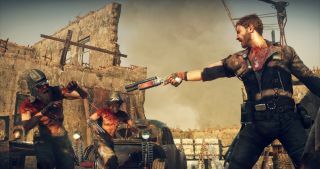 We're getting two Avalanche open world games this year: the sunny, colourful wonderland that is Just Cause 3, and the gritty, brown, post-apocalyptic Mad Max. I was already sold on JC3 when I heard the words 'Just Cause 3', and now that I've seen a bit more of Mad Max in action, it's moving up my wishlist too. While it seems to have a lot in common with Avalanche's Mediterranean Rico-'em-up, there are some obvious differences, including the need to scavenge water, fuel and other bits to fuel your vehicular adventures. Gamespot were given a 14-minute-ish presentation at E3 that provides a good long look at the upcoming game. If you're still on the fence, the above video offers a slice of all the driving, scavenging, fighting and harpooning you could be doing come September 1st. We went hands-on with Mad Max a few weeks ago too.